Created on Saturday, November 21, 2015. I last modified it on Sunday, February 21, 2016. Filed under Physical Objects, 3D Printing. 3D printing with PLA demands good cooling to produce accurate, attractive objects. I did tests to find a cooling setup that gives me the best quality PLA prints from my Printrbot Simple Metal 3D printer. 3D printing with PLA plastic demands good cooling to limit warping and produce an attractive surface finish. I performed tests to find a cooling setup that gives me the best quality PLA prints from my Printrbot Simple Metal 3D printer. I compared a 40 mm case fan and a 50 mm blower fan, pairing them with four popular styles of fan shroud (airflow shapers) and no shroud at all. The test prints were assessed for dimensional warping and the visual attractiveness of overhangs (partially-unsupported layers of plastic) in varying degrees of steepness. I found that the 50 mm blower fan outperformed the 40 mm case fan, both with and without shrouds, delivering pleasing overhangs and minimal warping. I also found a tentative relationship between the breadth of the airflow and the warping of the print, with shrouds that blow air over a wide area delivering prints with less warping than shrouds that concentrate the air. However, I found no real relationship between any shroud shape and the appearance or success of overhangs; all shrouds could print all tested overhang angles to the same quality. These results suggest that Simple Metal owners should be using a blower fan together with a wide-airflow shroud. I am now testing the influence of shroud shape on bridging (unsupported horizontal regions), which ought to be more informative than the overhang angles tested here. When you are 3D printing objects with PLA, you need adequate cooling to improve the appearance and strength of overhangs, bridges, and other difficult regions of a print. Most printers use standard computer fans to blow cold air onto the just-deposited plastic, and users have developed many different styles of ‘fan shrouds’ to direct the cool air to where it is needed. The problem is that there are so many shroud styles, and so few comparisons between them, that users take what is written about them at face value. To add to this, there are different kinds of fans too. What fan should you use, and what kind of shroud should you pair it with? In this article I use my Printrbot Simple Metal to compare four different shroud styles paired with two different fans, judging the performance of each pair by looking at overhang success and print flatness. No fan — I unplugged it. Stock 40 mm fan supplied by Printrbot (“E-Long DC brushless model YL 4010M 12S, DC 12V 0.10A”). 50x15 mm blower fan from eBay (“Gdt brushless DC fan, Bearing: Sleeve, DC 12V 0.12A, Shenzhen Gdstime Technology Co. Ltd”). The cubic feet per minute (CFM) isn’t marked on the fan and I couldn’t find the fan’s specs anywhere on the internet, so I had to measure it myself. I tied a 60 gallon (240 L) garbage bag closed, made a neat hole on the bottom to fit around the fan’s output nozzle, and then timed how long it took to fully inflate the bag. Based on that, this fan is approximately 8 CFM. Both of these fans are inexpensive and similar ones can be bought from eBay or AliExpress for <$10. I designed this blower fan mount to hold the blower for these tests. I used the included 40 mm fan spacer whenever I was printing with shrouds that were designed to stack on top of the 40 mm case fan. This design blows a stream of air towards the working area. It is typified by the official Printrbot fan shroud (the link is in Step 13). 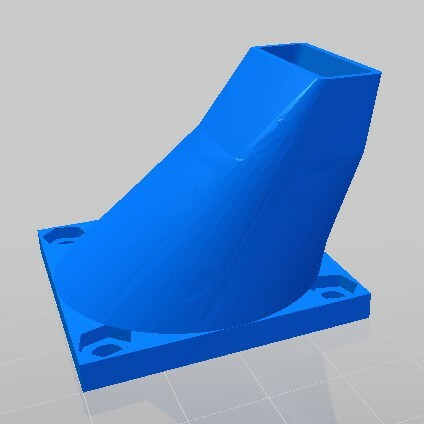 I used my modified version in this test (it is shorter and its exit hole is widened) because the original design produces a lot of backdraft and barely any throughput when paired with the stock 40 mm fan. Fan shrouds in this style encircle the hotend, with the idea that if air can be directed to blow from all sides of the newly-deposited plastic, then warping will be reduced because the plastic will cool evenly. 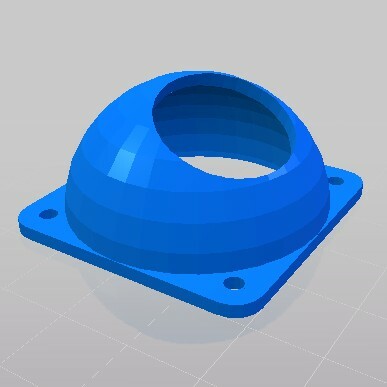 The most popular shroud in this style (and in fact the most popular PB Simple shroud on Thingiverse) is the Improved Printrbot Fan Duct by 50an6xy06r6n. 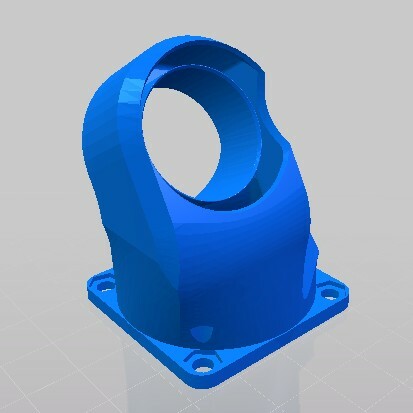 I used Fan_Shroud_v7.2.STL for this test because I have a ceramic hotend. While a Funnel shroud blow air in the general direction of the working area, a Nozzle shroud has a narrower opening to concentrate the air and shoot it directly at the newly-deposited plastic. I tested the shroud section of the Printrbot Simple Metal Improved High Flow Fan Blower Upgrade by SpannerHands. I mentioned in the Funnel shroud section that I had modified the official shroud to reduce backdraft issues with the stock fan. Backdraft is an issue when using a case fan with any shroud, and other people have noticed this too and designed their shrouds with extra large exhausts. The one I used for this test was the High Flow Fan Shroud for Printrbot Simple Metal by gotimeus. Inline 40x15 mm blower fan mount which holds the blower where the 40 mm fan used to be (the ‘High’ position). It includes a 40x10 mm spacer to stand in for the missing 40 mm fan, so that you can use this mount with any existing shroud design. 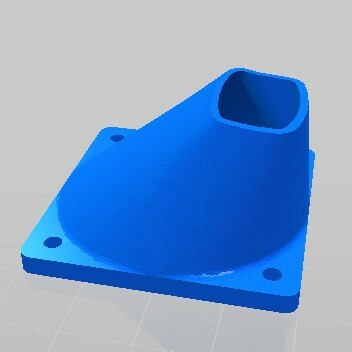 Low 40x15 mm blower fan mount (I think I deleted the design, sorry! ), which holds the fan at a low and steep angle so that it is blowing almost across the working area instead of blowing downwards from the top-left. This article uses the Overhang Test Print by walter. This object tests floating overhangs, which are overhangs that are unsupported from any direction except from where they originated; imagine balancing a book on the edge of a table. I did try some tests using supported overhangs — balance a book on the edge of a table, and then put your hands on either side of it to steady it — but abandoned those because supported overhangs of such short lengths printed successfully across all fans and shrouds. The Surrounding style shroud was not tested with the stock 40 mm fan because it could not produce enough pressure to supply it properly; it was basically all backdraft. Details of the printer and slicer settings are provided in the Supplementary section at the end of this article. 0 — Unacceptable. The lines along the bottom of the overhang are not touching and spaced irregularly. The square end of the floating overhang is rounded, sagging, or curling. I would be embarrassed to show it to someone who has never seen a 3D print before. 1 — Fair. The lines are not touching but they are spaced uniformly, so the overhang is attractive. The square end of the floating overhang is slightly rounded or uneven. 2 — Great! The lines are all touching and all spaced uniformly. The square end of the overhang is sharply square. Figure 1. The underside of an overhang test print. The first (leftmost) finger (10°) is scored 0 because it is so uneven. The second finger is scored 1. The other fingers are scored 2. With inadequate cooling, the thin ends of the floating overhangs curl upwards towards the hotend. This warping makes the print taller than designed, and the 10° wedge is most susceptible to it because it is so drawn-out and thin. To quantify the warping, I measured the thickness of the object’s spine near the center of the 10° wedge. I then placed the print flat-side down against a steel plate and measured the combined height of the plate plus the 10° wedge, later subtracting the thickness of the plate to find the total height. Comparing the total height with the height of the spine reveals the extra height added by warping. The change in object thickness (as percent) divided by the sum of all the overhang scores. Using no fan produced the most warping and the worst overhang performance of all test cases, with failure for any overhang shallower than 40–45°. No fan and shroud combination could produce a visually pleasing 10° overhang, but the 10° overhangs printed by all combinations (except for None+Naked and Stock+Open) were structurally sound. Using a blower fan with an Open shroud produced the least warping with great overhang quality (Table 1). Table 1. Summary of results. 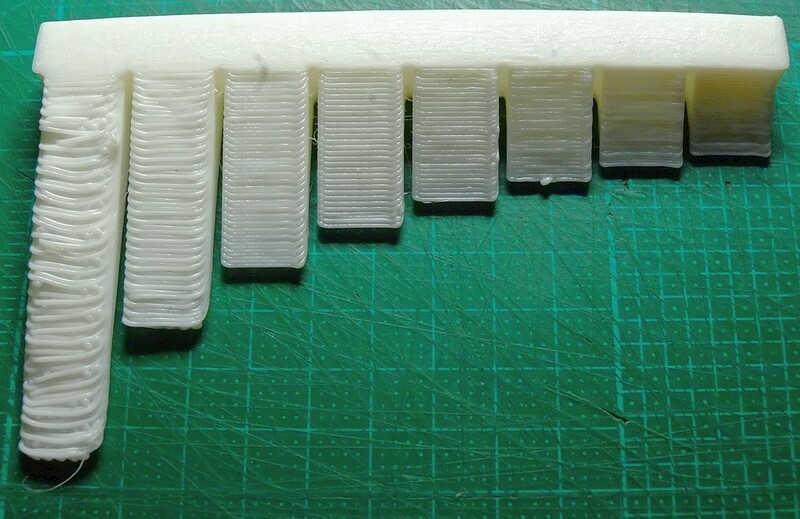 ‘Warping’ was the change in height along the Z axis for the whole print compared to the height of the print’s spine, caused by upward curling of the overhanging sections under poor cooling. Overhang appearance was a coded as 0 (ugly; lines not touching and not uniformly spaced), 1 (okay; lines not touching but uniformly spaced), or 2 (preferable; lines touching and uniformly spaced). ‘Weighting’ integrates overhang quality and warping into a final score; a higher weighting means less warping and better overhang appearance. All shrouds produced similar overhang quality, except for the Open shroud when used with the stock fan. Using no fan, or using the stock fan with either no shroud or an Open style shroud, led to significantly more warping that using any other fan and shroud combination. The differences between the other pairs were not significant (Figure 2). Figure 2. Change in height of the test object caused by warping. The choice of shroud largely did not affect the amount of warping. Groups significantly different from each other are marked with stars. The error bar shows ±0.096 mm (SD of raw spine thickness plus 0.02 mm for caliper error). Using the stock 40 mm fan without a shroud led to more warping than using a naked blower fan. The mounting of the blower fan in either high (inline with the Simple Metal’s 40 mm fan mount) or low configuration (below the 40 mm mount) did not matter (Figure 3). Figure 3. Comparison of warping between fan types with no shroud. Using a blower fan led to less warping than a stock fan or no fan. Groups significantly different from each other are marked with stars. The error bar shows ±0.096 mm (SD of raw spine thickness plus 0.02 mm for caliper error). It seems that the fan shroud you choose is less important than the fan type. The blower fan was consistently weighted above the stock 40 mm fan regardless of shroud. Using a blower also gives you the best possible airflow through any shroud you decide to use. Even though the difference in warping between shrouds was unclear, there is still a pattern of shrouds with airflow over a wider area producing prints with less warping (Open, Funnel, and Surrounding shrouds in declining order). Since there wasn’t a corresponding difference in terms of overhang quality, we can conclude that we want a shroud with broad airflow to prevent warping and that some other unknown factors must contribute to overhang success. These factors are almost definitely print speed and layer height (since a finer layer height will nest the lines of extruded plastic closer together). The role of the slicer is also important, and some slicers may be able to recognise overhang regions and slow the print speed for better results. b) Use a shroud with a larger airflow envelope. A future article will focus on printing 90° bridges, which I think will really show the cooling power of the different shroud styles. Printrbot Simple Metal with a Rev F Printrboard and ceramic hotend. PLA (Bilby3D white) at 200 °C, first layer 210 °C, printing onto alcohol-prepared 3M #2090 blue painter’s tape. 4 top/bottom layers (0.8 mm). 50 mm/s print speed, 75 mm/s travel speed, 30 mm/s bottom layer speed. Retraction of 1 mm at 40 mm/s. Minimum layer time of 10 sec, fan full speed at 0.6 mm layer height, minimum speed 10 mm/s and cool head lift turned off (it can create problems with printing very small details).